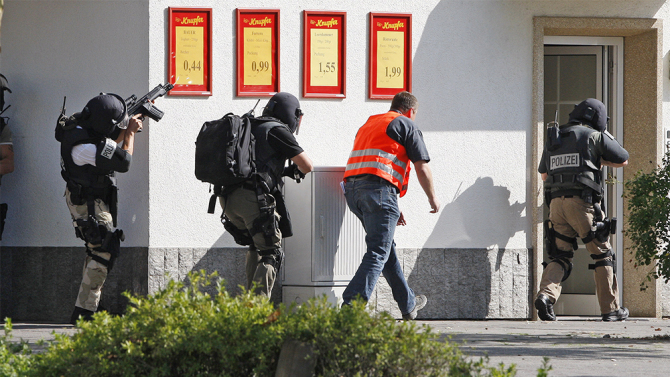 Ali Sonboli a German/Iranian killed 9 and wounded 16 others at a McDonald in Munich Germany. Apparently, he had been researching mass shootings, including that of Anders Brevik, the Norwegian man who killed 77 people in his home country. This compelled some to conclude that Sonboli was really a right-winger like Brevik since he researched Brevik. Someone else said they heard Sonboli shout "Hey, you foreigners, get the hell out my beloved German homeland. Others were pretty sure they heard him shout Allahu Akbar as he began shooting mostly young people. Either way, the media seemed happy to explore the right wing extremist perspective, rather than the Iranian Muslim connection. Just to be fair, of course. The media also emphasized that Sonboli was a teen, probably hoping that the world would see him like an angst driven, Iranian Holden Caulfield. "He's not a jihadist, he's just confused." "When a Muslim kills a bunch of people, everyone rushes to judgement, calling it terrorism." ​Why would they do this? Because of racism, even though Islam is a religion and not a race. But it’s close, and close in racism is similar to close in horseshoes. Meaning, it’s good enough for the media. “Maybe this German/Iranian man was just a nut. Maybe he lost his job and missed a car payment. Maybe that’s why he got an illegal rapid fire killing machine and began blasting men, women and children as they ate their Happy Meals and Big macs. Maybe it wasn’t Islamic radicalism at all, and the fact that he was a Muslim was just a coincidence, like the last 50 mass murdering coincidences involving Muslims. I mean, if I look real hard at the other 5 and ½ billion non-Muslims on planet earth, I can find a shitload of wackos acting just as bad. Uh, who said all Muslims were bad? Yes, you can always tell a great human being by their ability to battle straw men with relentless vigor. Find the absolute dumbest argument, loudly declare that this is what hateful people believe (even if they don’t) and attack it as though you’ve actually done something meaningful. This will enable you to morally preen, strutting your self-righteousness like a peacock exhibiting its feathery plume. Then, quickly change the subject like our masterful Secretary of State, John Kerry did, when he said air-conditioning was just as bad as ISIS, as he gave a speech to the world’s elite while staying at a million dollar a night hotel and eating food that costs more than your mortgage payment. “Don’t worry your pretty little heads” Kerry said, as he referred to the average Joes out there in the hinterlands—none of which were actually in the audience—that way the crowd of billionaires and potentates knew he had their back, just in case these average Joes and Josette’s got ideas and began to rebel against the heavy hand of Uncle Sam and his global pals. “AC for me, but not for thee,” was Kerry’s true meaning. In other words, get used to having less and less. Sure, we’ll throw some food stamps your way, maybe some unearned SSI and a little free healthcare…very little…and certainly not free. But I digress. What about the umpteenth mass murder by a radical Islamist, hell-bent on killing as any people as possible? “What Radical Islamist?” Kerry, Obama, The New York Times and Hillary ask. “How silly of you, don’t you know that there is no radical Islam? Now don’t worry you pretty little heads. Not even one bit. Don’t you know, we’ve got your back? So please turn off that AC. Here’s a food stamp, to show you how much we care. ​Here is a movie about dragons, just in case you get bored.